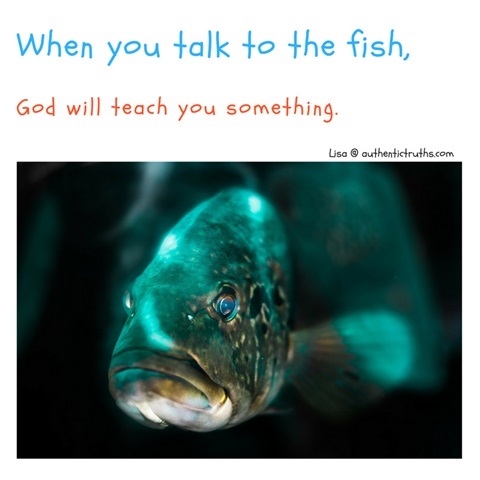 When You Talk to the Fish.. I went fishing for the second time today. I'm not one for hurting animals, so this was a bit of a stretch out of my comfort zone. Even though we released the fish back to the waters of safety, I found it difficult to have the fish sitting there, waiting for my husband to unhook it and send it on it's way. So while the fish and I sat, patiently waiting for the hubby to make his way to us for that release, I was gently telling the fish that he was coming and we would put him right back. I'm very blessed to have a husband who totally understands my ways, my quirky personality, and never said a word about me talking to a fish. I know some may think I'm a bit crazy, and that's ok. I embrace every part of myself, including the crazy parts. I only wish society might have that same gentle kindness toward one another. When someone we know is stuck, hurting, broken, confused, lost and alone- often times those souls are left out on the margins, detached and isolated from a world who doesn't understand. If Jesus chose to love first through the discipline he handed out, why aren't we in the business of loving first. He didn't condemn those being condemned. He taught the lesson of right and wrong in their particular circumstance, and he forgave, then he advised to go forth and sin no more. But before he could do all that, His love came first. If I believe a fish was important enough to talk to in what must have been his fear (at least in my world), then I should be that much more aware of loving those I know, or meet, even more sincere love and concern. We are called to love our neighbor as ourself- and pray for our enemies. Sometimes, without realizing it, we stop loving when we are confused and unsure when they are in that hard place. We don't first pray for our enemies. No, first we complain, judge, resent and hold anger against those who hurt us. 21st century media and viral internet addictions make it easy to do. Whether it's the neighbor living to the right of you, or the enemy living across the globe from you, you were told, as a commandment, what your role as a believer is- to love. I'll be fishing tomorrow- and no doubt, talking to that fish. But I will forever remember this lesson the Lord reminded me of, while I'm fishing.